Our first drink was a cosmopolitan. As this was our first foray into cocktail making, we had to buy some martini glasses and a cocktail shaker. All of which I'm proud to say I found thrift - for less than $3 total. 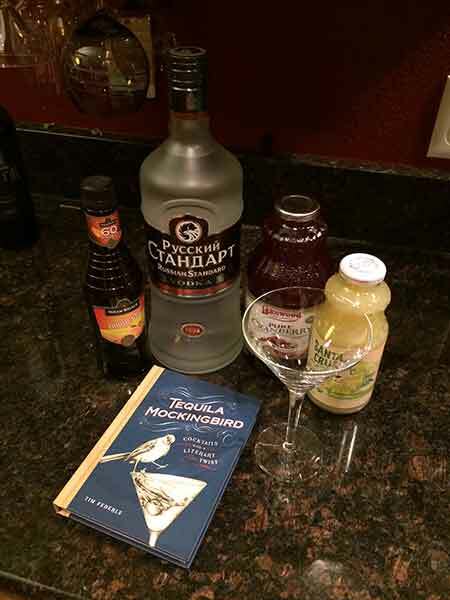 Russian vodka and cold-pressed cranberry juice. Chris had already bought the liquor. And he didn't mess around. Check out that massive Russian-looking bottle of vodka. But we were being purists. The recipe was simple but Chris nearly froze his fingers off shaking up our drinks. Do bartenders wear gloves or something? TADA! 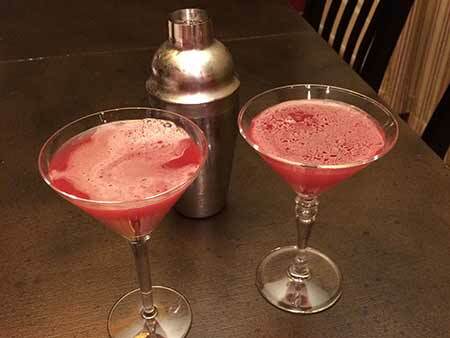 Cosmopolitans ... aren't they beautiful? We had decided to make an at home date night out of it and drink our cosmos while watching the Academy Award-winning movie starring Jack Nicholson. In other news, we had sold our couch a few days before, so we sipped these beauties while sitting on the floor of our couch-less basement, super far away from the TV so we could lean against the wall. It was quite classy. The cosmopolitan surprised me with its tartness. Apparently when I order martinis (or other frou-frou drinks that come in a martini glass) I always order sweet drinks. So that's what I expected. Public Service Announcement: Cosmopolitans are not sweet. They are tartimus maximus. I'm thinking it probably has something to do with the mix of pure cranberry and lime juices. However, after a sip or two, once my tongue (and expectations) had adjusted, I found myself enjoying the tartness. And by the time the glass was empty, I was ready for another.